Recently I discovered eShakti -- a unique women's apparel store online that allows custom changes in the style of the garment - sleeve, neckline, length can all be changed by the customer to her preference. eShakti customizes women's clothing from size 0 - 26W and custom sizes, too. The special appeal of our designs are the embellishments we give via print, embroidery and fabric texturing. So its designer-wear that is not readily seen in stores. Unlike other stores, we are never stocked out. All the hottest colors of the season in every product and style and in every size is always available. Sadly, I no longer see it on the website, but hope it will be available again soon. It's gorgeous! I was happily impressed with the sizing -- all of the measurements that I provided made for a dress that fits very well -- no puckers, no tight areas, no length issues. The quality of the material is of high standard. The dress is lightweight and very soft -- no itchy, scratchy fabric here. All in all, I am very pleased with this dress! I ordered the dress and received confirmation on the same day. I had the dress in my hands less than three (3) weeks later! How cool is that? A customized garment in less than 3 weeks? Oh, yeah... I like that! eShakti is very good about keeping the customer updated. I appreciate that. It's nice to know that you're important to them as a customer. If you'd lke to connect with eShakti, you can join them on Facebook and @eShakti on Twitter! eShakti also has a free Email Newsletter! 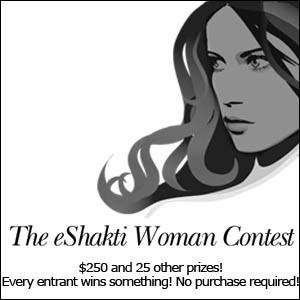 eShakti is holding an eShakti Woman contest right now and have invited our readers to participate! What does she do? Is she under 30 or over? What would you say about her lifestyle? Her income? Her educational level? more …. most importantly, what kind of person is she in her head? No answer can be wrong. But some answers can be more right than others! eShakti offers distinctive clothes for the full size range and also offers custom clothes which can also be custom-styled. What type of woman should shop at eShakti? Where else would she be shopping as well? Who do YOU think the eShakti woman is? Think you know? Enter the eShakti Woman Contest and tell them. You can win up to $250! And everyone who enters wins — every entrant in the contest gets a $10 gift certificate from eShakti. (only 1 per entrant, please). And no need to purchase anything to enter the contest. eShakti will choose winners based on both the quality of the thought and the relevance to eShakti. All prizes will be eShakti gift certificates to be used at eShakti. Don’t forget to tell them that Terri at Gathering My Roses sent you! Thank you! Contest valid until March 31, 2010. DISCLOSURE: I received a complimentary custom dress for the purpose of review. I was under no obligation to review this item. I received no monetary compensation. The opinions expressed are based on my own use and experience with the item.